As the USD is getting stronger, it cannot compete with the strong GBP. GBP is under the influence of Brexit issue which is supporting this currency in short term. 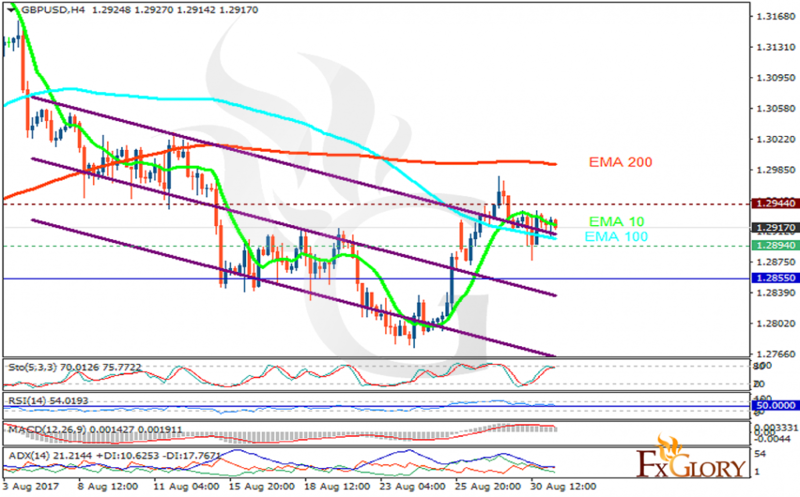 The support rests at 1.28940 with resistance at 1.29440 which both lines are above the weekly pivot point at 1.28550. The EMA of 10 is moving with bearish bias along the descendant channel and it is below the EMA of 200 and above the EMA of 100. The RSI is falling towards the 50 level, the Stochastic is moving in high ranges and MACD indicator is in positive territory. The ADX is showing weak sell signals. It seems that USD is not strong enough to beat GBP therefore buyers can target 1.30.